Scrum has proven to be an effective product delivery framework for digital products like applications or apps. However, Scrum is equally suited to build the wrong product efficiently as its Achilles heel has always been the product discovery part. What product discovery part, you may think now. And this is precisely the point: The product owner miraculously identifies what is the best way to proceed as a team by gating and prioritizing the product backlog. How that is supposed to happen is nowhere described in the Scrum Guide. Consequently, when everyone is for himself, product discovery anti-patterns emerge. 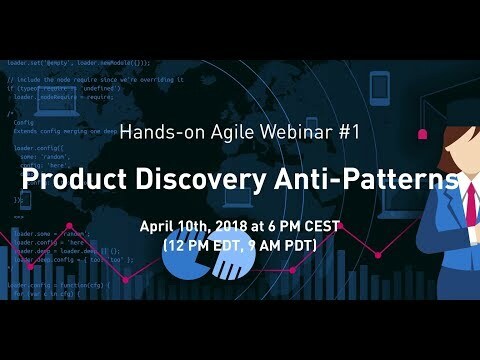 Note: If the browser will not start the video automatically, click here to watch the replay of the webinar product discovery anti-patterns directly on Youtube. A complex, multi-layered reporting structure within organizations that filters as well as delays the flow of information, thus impeding communication and decision-making. Additionally, particularly larger organizations struggle with the necessary transition at the core of the process of becoming an agile, learning organization: The move from allocating budgets to projects staffed with temporary teams group of FTEs to building and funding lasting product teams. A vision leads to a strategy which (probably) results in a portfolio of products (and services). Each of those products has a product roadmap that needs to be reflected in the product’s backlog, which ultimately provides the sprint backlog. This core agile product creation process is agnostic to the product delivery framework, be it Scrum, XP, or any other framework. Keeping this holistic product creation process in mind, you can often observe some of the following product discovery anti-patterns in practice. The incrementalism trap: You get so focused on improving incrementally that you miss the available innovative leap ahead. Remedy: Apply Elon Musk’s first principles thinking model and break down a situation into its elementary pieces to put it back together again in a way that serves your purpose better. A holistic product discovery & delivery process is at the heart of any learning organization. Filling the product discovery void of the product delivery framework of your choice becomes, therefore, is a necessity. And there are plenty of agile frameworks and methodologies to choose from for that purpose. Watching out for the product discovery anti-patterns listed above will save your organization significant resources in doing so. What product discovery anti-patterns am I missing? Please share with me in the comments. The stage gate process has efficient gates for governance and control. It also gives the Product head an ability to control the calendar and forecast business numbers. Scrum and agile techniques are good at discovering innovative and customer centric products. The tough part is to marry both of them and provide a process acceptable to the organization.